Like some other d-bloggers, I was invited to test-drive the new Medtronic 530G pump (formally the “Medtronic Minimed 530G with Enlite”). To be honest with you, I didn’t immediately jump at the opportunity. I had a few reservations and took some time to think about it, but ultimately decided to give it a go. I’ll discuss that thought process in another post. But for now, I think it’s helpful to express and document what I expect out of this trial and this baby-step towards a closed-loop system. Only then can I deem this a “success” or not. So what do I expect out of this system, that my current Medtronic Revel doesn’t offer? Well, not a whole lot. Not a heck of a lot has changed since the previous version. But what has changed is pretty big. Or small. (Depending on how you look at it). For years, all I ever really wanted was an Enlite sensor. I’ve used the Sofsensors loyally for three years, almost never going a day without it. When the FDA approval came and the Enlites became available to order via the Medtronic website, I tried to order some to use with my Revel pump, but was denied. Medtronic wouldn’t fill my order without a doctor’s prescription, and my doctor wouldn’t prescribe an “off-label” use of the Enlite (which is only approved with the new pump). So if it takes a new pump to get a new sensor, fine. I’ll do it. The Sofsensor insertion needles are also effective in install roofing shingles. The Enlite needles might be strong enough to staple two pages together. There’s not much to say here — it’s supposed to hurt less, and I am confident that this will be the case. I’ll take the staple over the nail any day. All the literature I’ve read and talks I’ve heard discuss how they’ve gone through painstaking measures to makes sure that the users don’t see the needle. They think that, because of feedback from the Sofsensor inserter, that we all are deathly afraid of needles and would rather have them hidden. Never mind that many a PWD has dealt with many a needle over his or her lifetime. Needles in general aren’t scary, it’s just THOSE Sofsensor needles! I would much rather see the needle and know what’s going on than have the whole thing hidden by a clunky opaque inserter device. And I’d rather be able to know that the adhesive has adhered before removing it (a gripe I’ve also got with the Mio infusion sets, but at least with those I can reach inside the center and pat it down a bit – sort of). But it’s still an improvement. My endo suspects that the Enlite’s accuracy will surpass that of the Dexcom. He figures that each new CGM that is released will top the competing one, otherwise they wouldn’t even bother. From the anecdotes I’ve read online, I wholeheartedly disagree with that; but fortunately for me I’ve never used a Dexcom. All I can compare the Enlite to is its predecessor. My expectation is that it will be slightly better, but not by much. The idea of making the sensor both smaller AND more accurate contradicts logic in my mind. So how much of the improvement is in the sensor and how much in the algorithm? I’ll probably never know. Will the improvement come in the form of sensing changes faster or getting the number closer to my meter? I don’t know that either. I’ll tell you my biggest gripe with the Sofsensors: for me, it’s “sweet spot” is in the 90-200 range. Outside of that range, it seems like forever for the sensor to catch up with my real fingerstick value, if it does at all. A post-lunch spike of 230 will never peak above 160 on my CGM. and when I’ve dropped to 65, my CGM is showing a slighly downward trend from 90. Those are the times when I need CGM most. So I hope this is fixed, but I’m on the fence over whether or not I expect it to be fixed. You know that new taping method, where a little strip of adhesive comes out from under the transmitter and wraps over top to hold it in place? I don’t quite trust it. Perhaps it will prevent the transmitter from flapping in the breeze, but it won’t prevent a kicking and screaming two-year-old from dislodging it when he doesn’t want me to put him to bed. So, I won’t be retiring the IV3000 anytime soon. But with any luck, this is the end of my skin getting pinched between the sensor and transmitter during those small “near-flaps”. That really hurts! Included in the stipulations of me participating in this trial is that I must use the entire system on-label. That is, sensors must be worn for no more than six days, and they must be worn in the FDA-approved location. Same for infusion sets — three days, max. (I also have to use the Bayer ContourLink meter, but that’s my meter of choice anyway). These things had better last a full six days, because if one of them craps out early, I can’t make up the time with another. (This is how my Sofsensor pattern works. Instead of depleting my thirty-day supply in ten equal increments, I would double the wear-time on some sensors and pull others within the first fifteen minutes). Would I be tempted to extend a sensor, thus violating the terms of my signed contract, being forced to return all of this trial stuff, and being publicly shamed? I’m hoping that the potential repercussions will discourage me from doing so. I’m also hoping that the task of changing a sensor will become No-Big-Deal rather than a Big Event, so I won’t be so inclined to postpone the change like I do now. But I also know, from experience, that the charge on the MiniLink transmitter tends to die on the seventh day anyway, so there’s not much to be gained by being a rebel. I also know that, though this is just a baby-step to the AP, that this will affect insulin delivery, and a wonky sensor could mean more than just some wacky numbers on a graph. I’d best improve my habits now, so that an overused CGM doesn’t lead to MORE insulin delivery when the next generation of pump (or the one after that) comes out. But one of my biggest gripes about the Revel, which I expect will still exist with the 530G, is lack of advance warning when a sensor is about to expire. See, the Revel would tell me 90 minutes in advance when a calibration is is due, which is helpful so I can time it when my BG is level, and hopefully so the next calibration isn’t when I’m sleeping. But there is no such warning before a SENSOR END. It just happens, and if I’m playing by the rules and don’t have all the stuff ready to change it at that very moment, I’m out of luck until I get home. Still, the temptation will be there. Lord, give me the strength to resist it. For most of my life, I’ve slept on my side. But since I started wearing sensors on my arm, I’ve realized that I am limited by which side I can sleep on (squeezing a sensor between your body and the mattress can be quite uncomfortable, and probably isn’t good for the sensor either). For the last several months, I’ve trained myself to sleep on my back, which isn’t particularly comfortable. Now that I’m forced to wear the sensor on my abdomen, maybe I’ll sleep better. Threshold Suspend aims to threaten that, but in all seriousness, I doubt I’ll ever have a chance to test this out. I haven’t dropped below 60 overnight in a really long time, and when I have, my sensor lagged to the point of ineffectiveness (see “accuracy”, above). Perhaps if the sensor is more accurate, it’ll kick in at some point. I’m told the “siren” that comes with Threshold Suspend is louder than the other alerts. I highly doubt that, since it’s the same speaker and the same solid plastic case, but maybe the tone or melody is more ear-piercing. My troubles with Motor Errors on the Revel have been well documented. As have others. I’d like to think that they’ve done something internally to make these pumps a little more robust than the previous product line. With all the issues that have been reported, I’d be shocked if nothing changed. 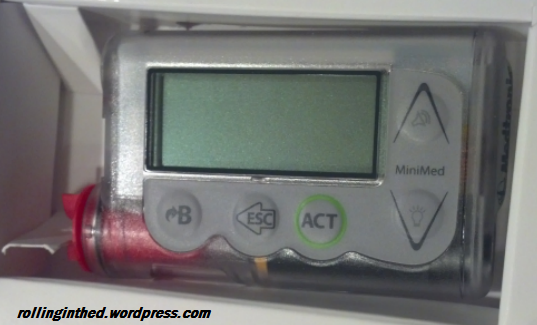 Medtronic recently reported that they’re updating the mechanics behind the buttons on all of their pumps. I don’t know if I’ll get the new buttons or the old buttons, but I hope they aren’t any more difficult to use. I’ve heard complaints about the Animas pump buttons in the past. For some reason, it’s missing that radiant glow shown in the ads. I’ve decided to go with a white/clear pump this time instead of the black (aka “smoke”) pump I’ve worn for the last eight years. Partly to be different, and partly because I think it’s cool to look through the clear part at the inner-workings of the device. (Also, despite being a PC and Android loyalist, Apple has turned white into a stylish color for electronics). It will probably be noticed more by others. Will that be a good thing or a bad thing? Will I be self-conscious or will I crave the attention? We’ll see. In a way, I see it as a way to push myself to become more forthcoming about my diabetes in real life, and not just online. It’s just a three month trial with the white pump. If I don’t like it, I can always go back. After all, there is that saying…. 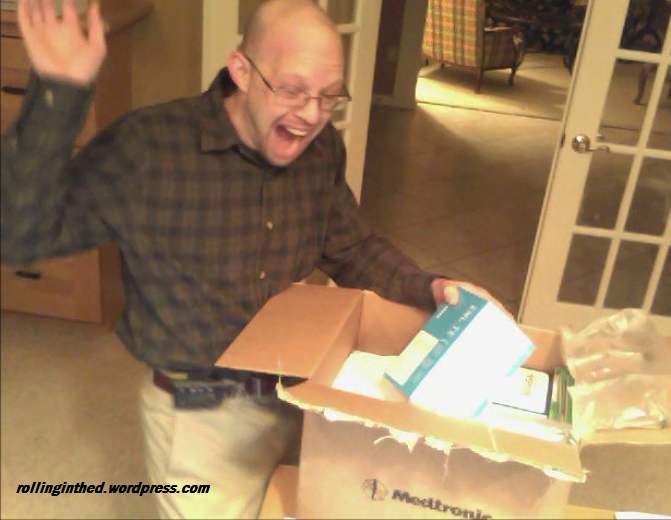 As part of my agreement with Medtronic, I’m required to disclose that Medtronic loaned me these products at no charge, and that they cannot and will not exert any influence on my writings. I will be honest and candid in any review of Medtronic’s products and services. Posted on April 3, 2014, in Continuous Glucose Monitor (CGM), Diabetes, Insulin pump, Personal and tagged 530G. Bookmark the permalink. 11 Comments. I love the clear one. Are you old enough to remember the clear Swatch watches of the 80s? It’s cool that you are trying the thing. Did you see what Christel wrote about the new hidden-needle kachunker? Ah, I remember the clear wristbands on the Swatch watches, but not the watch itself. My swatch was dark and had fluorescent orange, green, and pink shapes on it. Ah, the 80s. I did see Christel’s post about that — actually read it a few hours before putting my own first Enlite in, so it was fresh in my mind. (I’ve been delinquent in finding time to write blog posts, so I drafted this one retroactively, as if I hadn’t tried it yet). The flappy tape has worked well for me. I was nervous about it at first, but have not had a single issue with a sensor being ripped off (though I do not have a screaming 2 year old at home either…) I went so far as to give away my remaining IV3000 tape! Between the sensor overtape AND the flappy tape, that sensor is in it to win it for at least 6 days. I usually wear mine for 7 days, and then the sensor just dies and I get a “lost sensor” alarm. By the way, one of the menus on the pump shows you how long you have been wearing your current sensor. It won’t alarm until the sensor actually ends, but you can look on the pump and see that you’ve been wearing it for “4 days 6 hours” or whatever the timing is. The same menu also shows when the next calibration is due, so you can see that before the warning alarm sounds. I’m still not on board yet with the idea of Minimed’s sensor, so I’m looking forward to hearing more about your experience. I love my Dexcom SO much, and love that I’m sitting here wearing a 3 week old sensor and it’s still giving me dead-on correct numbers. I really hate site changes. I want to do the least amount of them possible. 6 days just doesn’t sound worth it to me…guess we’ll see what the future holds! I’m interested to follow your adventures! I hope it works well for you. Thanks Karen. And yes, I’ve already got quite a list of suggestions even prior to starting the new pump/CGM, and that one’s on the list! Yeah, that flappy tape thing has to go. I’ve been using the Enlite since December with no problems until this week. Figures – I’m away from home on business and only brought 2 replacement sensors. Arrived on Sunday night and saw that the sensor would end overnight (also not a fan of no END warning) and charged, then changed in the morning. Used a spot I’ve had no problems with before, then 2hrs into it, I caught the glappy end with the side of my hand as I was taking off my coat and yanked it right out. Goodbye sensor #1. Fast forward to the next morning. Repeat if the previous day, but in a different spot and with extra tape. This time bumped up against a conference table and… Goodbye sensor #2. End of travel supply. I’ll be calling customer support tonight to complain and see about them “fronting” me the 2 weeks worth of sensors that shouldn’t have been wasted.